Watch a travel video of riding Haflinger horses during autumn at Ranch du Fjord in Charlevoix, Quebec. View the changing leaves horseback riding horses at Ranch du Fjord, located a few hours from Quebec City and Montreal in the Charlevoix region of Quebec in this Equitrekking travel video clip. 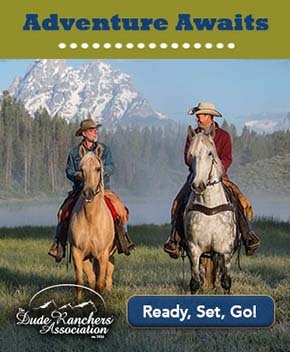 DARLEY: Next we’re visiting Ranch du Fjord on the coast of Charlevoix. Francois, who joined me rock climbing, is riding with me and Poitras family, who own Ranch du Fjord. They raise Haflinger horses, a breed that is native to Austria and well suited for the conditions here in Charlevoix. FRANCOIS: So, a lot of mountains, a lot of snow, lot of difficult ground so we can go all year round with them in different kind of trails that we have here, same as Austria. DARLEY: Francois, what do you like about living in Charlevoix? FRANCOIS: Well, Charlevoix for me, its sea and mountains, and nature, culture, people, and with all of that with me I found peace here in Charlevoix. DARLEY: Most residents of Charlevoix actually live inside a crater. 350 million years ago Charlevoix was hit by a meteorite weighing billions of tons. Later, glaciers scraped across the land, giving Charlevoix its dramatic rolling hills and rocky coastlines. Here the mountains meet the sea, and it’s this scenery that attracted American travelers like President William Taft to summer here. DARLEY: I love the red on this tree and all the colors around here. It’s so pretty. FRANCOIS: Yeah. Well, that’s part of the beauty of the forest of Quebec province. You have three kinds of vegetation here that you usually find in three different places, but all at the same place in Charlevoix. DARLEY: We continue on to discover more of this vegetation, and enjoy leaf peeping, as we head towards our final destination, a pristine waterfall. Riding here in the quiet of the forest, I can understand how people like Francois, and others, have found peace and happiness in the protected natural boundaries of Charlevoix. 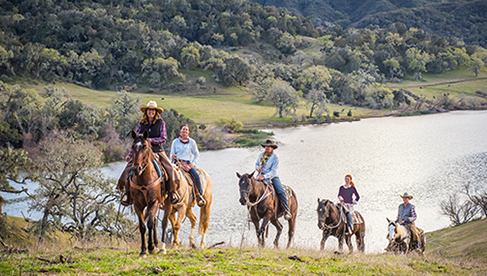 Learn more about horse vacations around the world in the Equitrekking Vacation Guide. Surf our site to learn more about travel to Quebec.